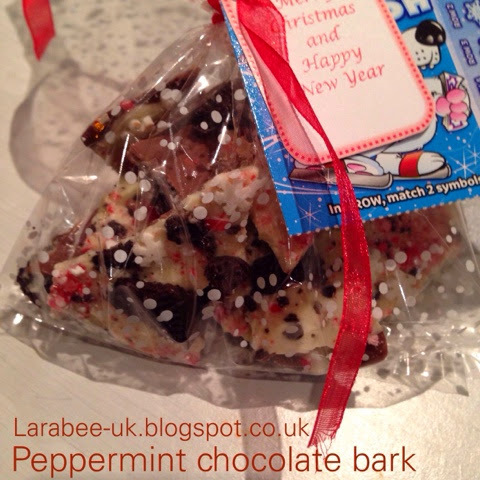 I've been admiring chocolate 'bark' recipies for a while now and decided that I wanted to make one for T's nursery teachers (the ones who no longer teach him!) just as a little gift. I decided to make my own peppermint version, who doesn't like peppermint eh?? I made these quite thin, because they are peppermint, but you could increase the chocolate quantity or have 2 portions. Mine made 4 decent bags. 1. Heat the milk chocolate in a bowl, I've a 850w microwave and heated for 60 seconds removing at 30 to stir and check, then checking every 10 seconds. 2. 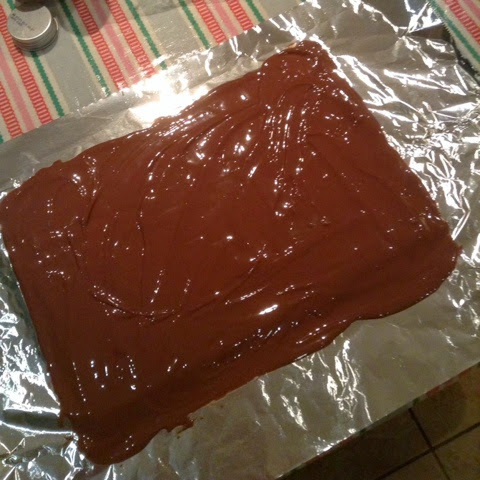 Pour the milk chocolate onto silver foil or baking parchment. Place in the oven to harden. 3. Whilst chocolate is hardening, smash up the candy canes & Oreos. 4. Once the milk chocolate has hardened, melt the white chocolate using the same method. 5. 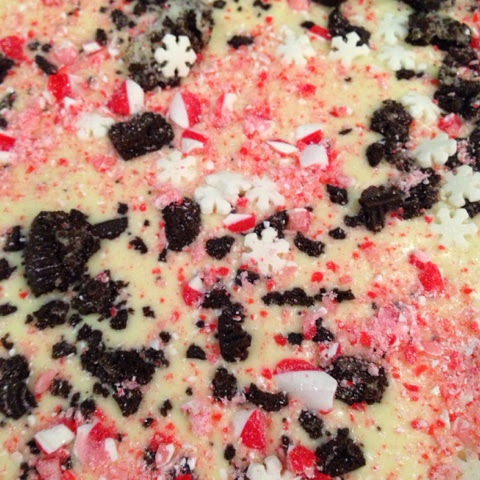 Stir the peppermint essence into the melted white chocolate, give it a good stir to prevent it splitting. 6. Pour the white chocolate over the milk chocolate and sprinkle with the toppings. 7. Leave to set overnight. 8. Break up the bark and split between presentation bags. I added a little tab and a lottery ticket to each of mine. And... I'm making another batch now for The Hubs! This looks so good! I have often wondered what 'bark' was, thanks for explaining it to me! Looks delicious and very festive! I had wondered what was the best way to layer the two chocolates. This might have to feature in our neighbours sweetie boxes this year!